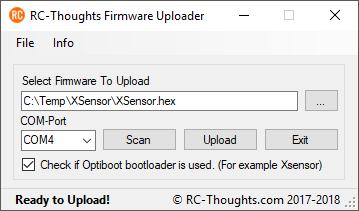 I got some report’s from users that with slower USB-adapters and/or computers the RCT Firmware Uploader did not wait long enough for the upload to finish before thinking there was an error with upload. This is now fixed with new release-version 1.0.9. So go to FW-Uploader page here and grab it if you need it!